by CORNELIUS BROWN, F.R.S.L., author of "LIVES OF NOTTS. WORTHIES" and other works. "The prior of Lenton (9 John) produced the gift of Hugh de Burun, and confirmation of Roger, as it is before mentioned. The prior of the hospital of Jerusalem pleaded that they had seisin of the town of Oscinton where the church is situate, of the gift of Roger de Burun who gave them that town, and produced his charter testifying the same; and also another charter, which especially spoke concerning the church. The Prior of Lenton's atturney knew not that he should put) himself on the jury, before he had the advice of his master, and therefore day was given till fifteen days after Easter, at which time the jury found that Roper de Burun presented the last parson, which died, to the church of Oscington, and therefore the I brethren of the hospital should have their seisin, and the prior of Lenton be in mercy. 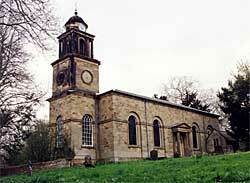 Yet not very long before Roger Archbishop of York admitted and instituted Galfr, the clark, parson of this church upon the presentation of the prior and monks of Lenton, and gave them 2s. a year as a pension out of it. There was a fine levied at Leycester the Munday after the feast of St. Andrew that same year, viz. (10 John), between Peter, prior of Lenton, and Robert,the treasurer of the prior of the hospital of Jerusalem, concerning the advowson of this church which the prior of Lenton released to the hospitalers, and they gave to Lenton the moiety of the advowson of the church of Huneswithe of their gift. And so by a fair exchange the unseemly dispute came to an end, and Ossington was enjoyed by the Knights Hospitallers, until that period of disendowment came which saw them and most religious houses fleeced of their choicest possessions. In the 34th Henry VIII., Charles Duke of Suffolk had licence to alienate the manor and rectory to Richard Andrews, gent., and his heirs, the aforesaid Andrews being, we assume, the same speculative gentleman who obtained a lease of Blyth Priory, and who is described by an eminent authority as "among the chief monastic stock jobbers of the day." On the demise of Andrews the manor passed to Edmund Cartwright, who had married for his second wife Andrews' daughter Agnes, his first wife, Anne Cranmer, having been a sister of the Archbishop of Canterbury. From Edmund Cartwright the property descended to his son George, and thence to his grand son William, who died in 1602, to whose memory and to his wife Grace there is a fine monument at the east end of Ossington Church. It bears in the centre panels the kneeling effigies of husband and wife, and in the lower panels the figures of their twelve children. The eldest son, Fulk Cartwright, married a daughter of Sir Henry Pierrepont, Knt., of Holme Pierrepont, who was also buried in the church, and had a brass erected to her memory. 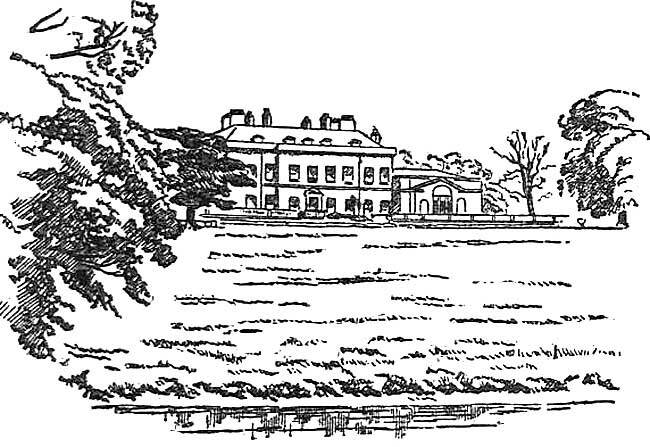 The Cartwrights continued at Ossington throughout the period of the civil war, when a portion of the house was destroyed, and it was not until 1753 that they parted with the property, some of them settling at Marnham Hall, a few miles away, as in our previous article on Marnham may be noted. The owners in 1753 were four heiresses, and these ladies sold Ossington to Mr. William Denison, an opulent merchant of Leeds, who took up his abode there, and was High Sheriff of the county in 1779. Mr. Denison, by the exercise of great diligence and sagacity, accumulated a large fortune, amounting, it is said, to three-quarters of a million. One of the successful enterprises attributed to him in several local publications may be thus described: When the great earthquake took place at Lisbon, swallowing up a large portion of the city, many of the inhabitants who escaped with their lives were left almost destitute of provisions and other necessaries. Mr. Denison happened to have at that time a ship heavily laden with such goods as the Lisbon people stood urgently in need of; and the captain of the vessel, who had heard of the calamity, sailed at once for the unlucky city, arriving there in advance of any other ship. The result was a ready sale at high prices of the whole of the cargo, and the realisation of a profit which has been stated to have been equivalent to a large fortune. That this is not mere tradition is assumed from the fact that when Mr. Denison died at Bath, after discharging his public duties faithfully and well, the monument erected to him in Ossington Church consisted of a full-length marble figure, standing on a pedestal, having a scroll in his hand, and underneath him the representation of a ship unloading in the Port of Lisbon. From this successful and worthy gentleman the estate passed, in 1782, to his brother Robert, and subsequently to his nephew, Mr. John Wilkinson, who assumed the name and arms of Denison, and was father of the late Speaker. Very rarely has it fallen to the lot of any man to be blessed with-so clever, so high-minded, and altogether so excellent a family as that of Mr. John Wilkinson-Denison. Several of his sons rose to distinguished eminence in the service of the country, and one and all possessed talents of no ordinary kind. Mr. John Evelyn Denison, the eldest son, became Speaker of the House of Commons. Mr. Edward Denison entered holy orders, and became Bishop of Salisbury. Mr. William Thomas Denison became Governor-General of the Australian Colonies, and received the honour of knighthood. Mr. Geo. Anthony Denison is the well-known Archdeacon Denison of Taunton, in whose interesting book, "Notes of my Life," many entertaining details are given of what he witnessed and experienced in his boyhood days at Ossington, Newark, and Southwell. Other members of the family have added to the laurels which encircle the name. Mr. Edward Denison, M.P., a son of the Bishop of Salisbury, was a yonng philanthropist of brilliant talents, and Lord and Lady Ossington will be long remembered with gratitude and affection. Ossington -- the terraces and lake. Since it passed, nearly a century and a half ago, into the hands of this eminent family, Ossington has been well cared for. The hall has been rebuilt, and the gardens and terraces laid out with great taste and skill. There is a charming lake near the mansion, where the wild fowl are wont to congregate at certain seasons in large numbers, and the view from the windows looking across the terraces is most picturesque. 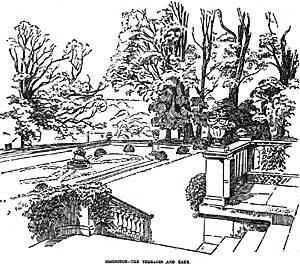 Our illustrations of this pleasant country seat and its artistic surroundings are from admirable photographs placed at our disposal by Mr. G. Green, photographer, Newark.